Today I went to a local dollar store to buy a plastic storage bin and while at the checkout counter I noticed they were selling Maxell blank chrome cassette tapes. I did a double take–it was a little like seeing an old friend for the first time in years–and almost tripped over myself while waiting for my change. My trusty analog friend is still alive and kicking! From sixth grade through the end of high school, my musical life revolved around cassette tapes. I bought music on cassette, I recorded sound off the radio onto cassette (hours of jazz drum solos, classical, fusion, and even instrumental New Age), I made mixes onto cassette, and I recorded and overdubbed my own music onto cassette. Somewhere I even have a cassette recording of my prepubescent high-pitched voice talking on the phone–a secret recording of one side of a phone conversation. I had one of the first Sony Walkman portable cassette players too (and many subsequent incarnations of it). 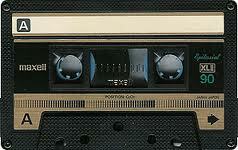 Post-records and pre-CDs, cassettes were my go-to, vitally useful technology. One thing I remember about cassettes is how finicky they were–how sensitive to environmental conditions, perhaps even to the sounds that I recorded onto them. In the 1980s, I spent hundreds of hours methodically hand winding my tapes and cleaning the tape heads and capstans of my boomboxes and Walkmans in an ongoing effort to prevent the dreaded “wobble” sound: your cassette plays back unevenly, usually at a slower speed. Tape wobble, for me, was the ultimate example of technology not functioning transparently, and it was a major drag (though in retrospect, perhaps wobble was a kind of liminal moment that I couldn’t yet recognize?). That being said, its spectre inspired my almost superstitious flights of preventative care–note to self: keep tapes tightly wound and of sunlight–in the hopes of keeping my audio technology running smoothly. I became a bit of an amateur expert on cassette tapes, scrutinizing the sound quality differences between normal UR (type 1), XLIIS (CrO2) or chrome, and–the gold standard– MX (pure metal particles) or metal tapes. I usually chose chrome, but had a few metal tapes for special projects. I also marvelled at those strange long distance beasts one could only find at Radio Shack: the 180 minute tape! But use such things at your own risk. Once I made the mistake of recording three hours of late night jazz radio onto a single tape. Bad idea. Suddenly, the tape gets jammed mid-recording, and yards of that wafer thin 180-minute spaghetti tape is oozing out of my boom box. Experiences like these remind tech-heads how resolutely physical and fragile analog technologies can be. During college I moved my music consumption to CDs, and then, like millions of listeners, my music went virtual onto MP3s and wave files. Today, of course, “record stores” are practically obsolete in North America, and cassette tapes are just one more fetishized object (like the LP in certain circles). There are odes to cassette culture out there, though, including novels that revolve around the “mixtape” or homemade music compilations recorded onto cassette (see Nick Hornby’s High Fidelity and Rob Sheffield’s Love Is a Mix Tape: Life and Loss, One Song at a Time), books on the aesthetics of mixtapes themselves (see Thurston Moore’s Mixtape: The Art Of Cassette Culture), even a fine ethnomusicological study of cassette culture (see Peter Manuel’s Cassette Culture: Popular Music and Technology In North India). I guess objects, though, always have the ability to conjure and cast spells–or at least inspire flights of remembering– partly through their very objectness (or what art anthropologist Robert Plant Armstrong might call their “affecting presence”). Will downloaded MP3s ever engender this kind of magic? Or is the remix culture/fungible audio paradigm of today without any substantial vapor trails of its own?